We’re dedicated to the study and preservation of the history of Durham Township, Bucks County, Pennsylvania. Historical Society meetings are convened on the 4th Tuesday of each month at 7:00 PM in the Durham Township Meeting Room. Additionally, special speaker presentations are periodically held on Sundays at 2:00 PM in the Durham Mill. Please consult our Events page for the most current information and updates. 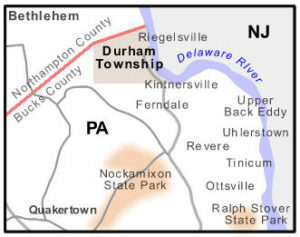 Durham Township and its residents have played a major role in the development of the United States from the colonial era into the present. Durham is located in the northernmost section of Bucks County. It is bordered on the East by the Delaware River at Riegelsville, on the North by Northampton County, on the South by Nockamixon Township, and on the West by Springfield Township. It is the second smallest of Bucks County townships, consisting of some ten square miles. Cooks Creek meanders down the center with hills on each side thus forming the Cooks Creek Watershed. The hills that border the township watershed have been worked as farms almost since Europeans arrived in the latter part of the seventeenth century. Durham remains a strong farming community even today. 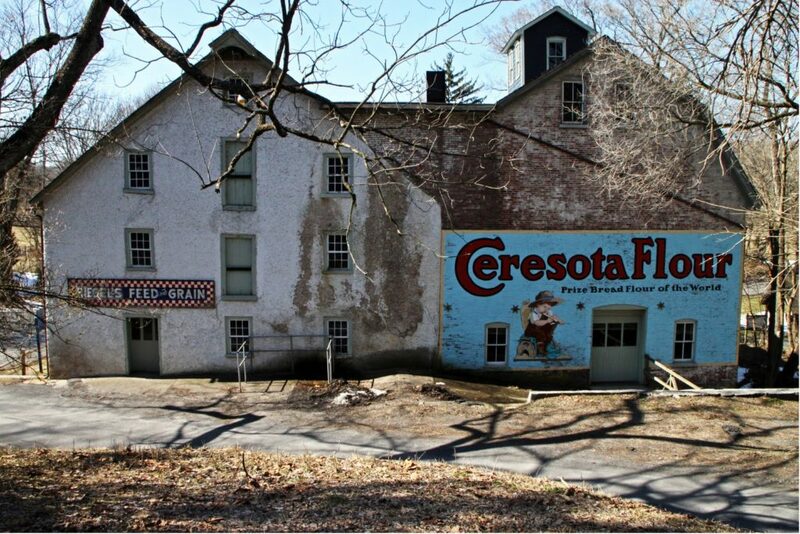 It has a Village Center within which is a large gristmill (circa 1820) which has remained unchanged except for an add-on section since it was built. Much of the original gristmill machinery remains intact inside the timber framed structure. The mill, a registered historic property, ceased operation in 1967, and is now owned by the Township. The Durham Historical Society has its office in the mill. Within “Durham Village” are many houses (still used as dwelling units) and a former store (now a private residence) of historical significance. The quaint, well kept houses here are reflective of the ones that existed in the 1800s. The Society, in conjunction with Durham township, has taken the initial steps to restore the Durham Gristmill. All contributions to our established fund will be used for purposes of renovation. Please visit the Membership page if you wish to make a contribution toward this restoration effort. Or you may also contribute through our GoFundMe campaign.